Hi, friends! Today I am excited to share a fun DIY for making abstract pillow cases with fabric paint, working with our good friends over at Jo-Ann Fabric and Craft Stores. This past year I’ve been obsessed with abstract everything from paintings to textiles to home decor pieces. And in this new year, one of my big goals is to refresh all my spaces, even if it’s something as small as a new simple accent. I have been crushing on these pillows since I spotted them on Gal Meets Glam a while back, and wanted to try my hand at creating something inspired by them! And, of course, I couldn’t stop without doing a colorful abstract pillow as well! Supplies Needed: For each set of two pillows you will need 1 yard of white denim (for the front) and 1 yard of black or colored denim (for the back). You will also need fabric paint. I like matte fabric paints best, but I’ll branch out to any type to get the right colors for the colorful pillow. You’ll also need a used gift card. A sewing machine is optional. If you don’t want to sew, buy pre-made plain pillow covers. For pillow forms (I used the 20″ x 20″ and 24″ x 24″ sizes). The painting process is super simple! 1. Squirt fabric paint directly onto your denim or canvas. You can see here that I used quite a bit. 2. Use the old gift card (or any piece of small, hard plastic) to scrape the paint across the fabric. It will create a different type of line than a paint brush. It’s cleaner, but still messy looking in a cool way. It’s also MUCH easier to clean up and control your lines. 3. Continue adding lines all over the fabric. 4. Crisscross some of the lines for an interesting effect. Allow the fabric paint to dry completely before sewing. Next, stitch your pillow up. If you’ve never sewn a pillow, learn how here! For the colorful pillow, I did the same exact technique, but created blocks of color instead of lines. Credits// Author: Elsie Larson, Project Assistant: Laura Gummerman. Photography: Laura Gummerman and Emma Chapman. Photos edited with The Signature Collection. So cute! Where can I find pre-made denim covers? Great idea!! I like this because I’ve bought pillows like this in the past, and thought to myself – I could totally do this. In fact, I think it would also be cool to paint these designs onto basic shift dresses, or even converse runners! i’ll put some yellow though to match with my room. So simply and versatile! I’m always on the lookout for easy DIY pillow covers- thanks! oh I so love the colors. it makes me feel a need for some new pillows. This is beautiful Elsie! As always, you’ve picked a great colour scheme. I’ve been indecisive about buying new pillow cases for ages now… But this DIY might have solved all my problems! Those pillows are really cute, but I’m wondering – will that paint be washing machine safe? I love this! So design-y and professional looking. I would never guess they were hand painted. Would it also work on a drop cloth material? I know I have that laying around and if I could use it up on this project that would be great! love this room ! beautiful colors and creative idea! Love this idea..but where to get plain pillow cases made of denim fabric? Love how it totally transformed the couch to looking brand new.. These are so cute. I can’t believe you made them! This is so gorgeous, I need to try this! This is so cool! I didn’t know it was that easy to paint your own fabric! Must try. Love these pillows! Sure to try them out soon! Wonderful colors you chosen. Fabric dyeing is a fun and creative hobby. These look really great. 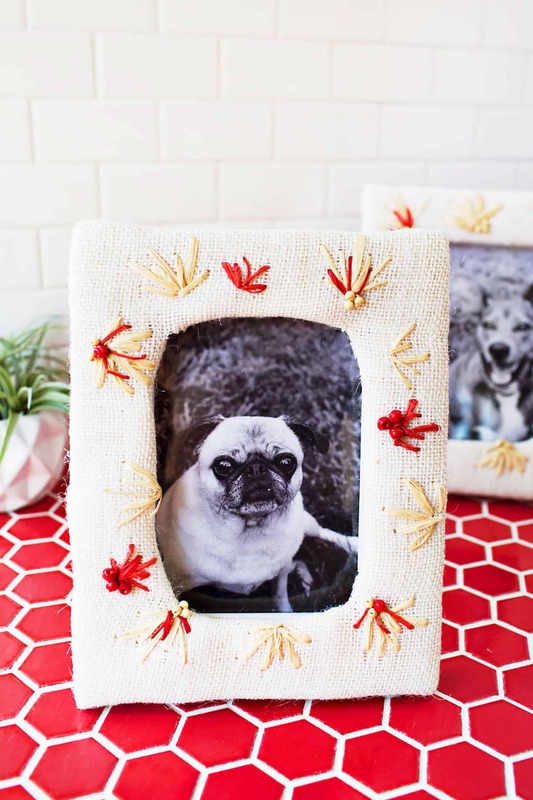 This is one of my favorite DIYs you’ve done lately. I’ve always associated fabric paint with weird 90’s t-shirts and things like that, so I’ve really stayed away from it. Does it still have that plastic feel on the fabric? Either way, looks like I’ll have to give this a try. This is such a cute idea! Pillows are great, because they are such an inexpensive way to give your room a new look, but these are even better because they are all one-of-a-kind! Thanks for an easy tutorial. I usually like the idea of diy projects, but rarely follow through. This is definitely something I could pull off though. amazing DIY! They came out so beautifully! thanks for sharing! The color selection for the pillows is a nice mix! It brightens up the space. I’m also loving that coffee table! 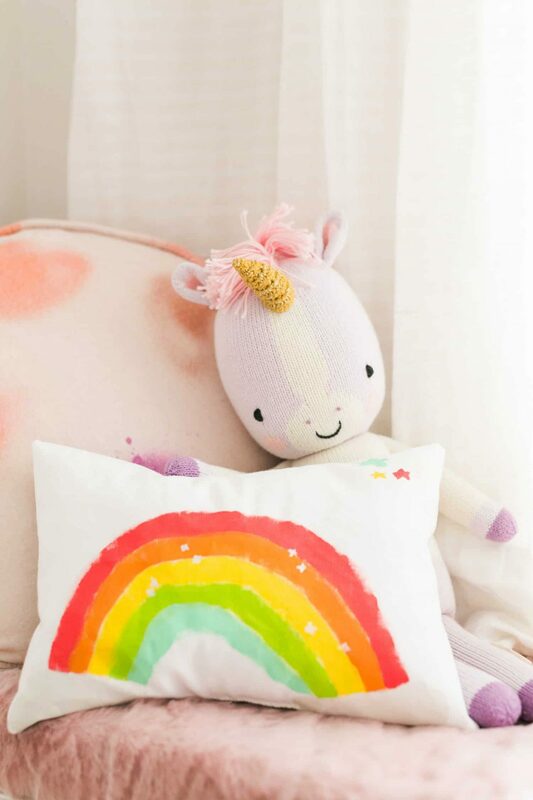 Oh my goodness, I LOVE LOVE LOVE these pillows!!!!!!!!!!!!! Super cool and so simple! Great DIY… I wonder, how do you wash these? Can they go in the washer? I assume no. Is there not even something you need to seal the fabric paint? How well do these hold up over time? What a great way to get personalized textiles for your space! I CANNOT get over how amazing your blog design is! I LOVE all the color! It suits you way better than before. LOVE it! Guys, I LOVE the updates to the site! Especially the hand drawn icons at the bottom…reminds me of old school ABM. 🙂 Very very very cute – keep up the amazing work! Beautifull pillow cases, excelent tecnique, what I like the most, is that you will make exactly the accesory you need to complete the decor proyect.